Based on current degree day calculations several areas in southern Wisconsin are at, or a little past, 300 accumulated weevil degree days (base 48o F) which is the best timing to initiate scouting. At 300 weevil degree days, eggs are starting to hatch. 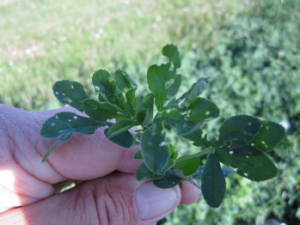 Pinhole damage may be difficult to find because larvae are small and do not consume a lot of foliage. 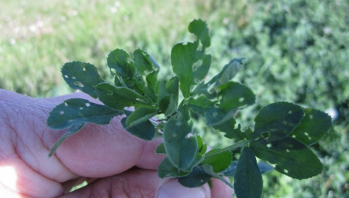 Concentrate your efforts on the leaflets at the tip of the stems as small larvae often like to hide in these folded leaflets prior to bud development. Scouting at 300 degree days will give you a heads up on damage potential and allow more time to reach a control decision, if needed. Maximum feeding should occur between 600 and 800 weevil degree days. A treatment threshold of 40% tip feeding is suggested. This is not to advocate treating at 40% defoliation but rather when 40% of the stems have signs of weevil feeding. If you are over the suggested threshold and within 7 days of cutting, consider an early harvest. Timely cutting is still our best control option and you do not have to delay harvest because of the insecticide’s pre-harvest restriction. For those fields with heavy first crop weevil feeding, plan to check second crop regrowth for feeding on newly forming stem and crown buds. If environmental conditions are conducive, larvae and/or adults can survive harvest and cause significant damage to regrowth. One of the challenges you may have is knowing when the potential for feeding is over. For that I have two suggestions. First look for silken cocoons (see picture below) which can be found on leaves or w/in the leaf litter on the soil surface. Secondly, use an insect sweep net and look for larvae. 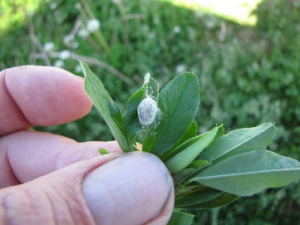 Small larvae are not easily dislodged, however, late instar larvae can be easily found in the net. 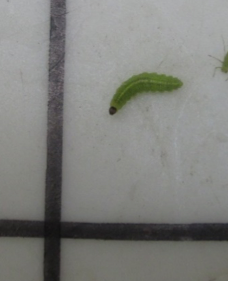 Numbers swept are not used for management purposes other than to tell if larvae are present or not. At this point in time, I have not received any calls regarding above threshold feeding.